Less than four weeks from the Super Bowl, the field is nearly ready to be played on, thanks to long days at Levi's Stadium in Santa Clara, California. A crew is working to install fresh sod and make every necessary tweak in regards to weather and other potential issues. No turf trouble this time. Not yet, at least. Nor does NFL field director Ed Mangan expect it. "We're in good shape the way we are," Mangan said, noting that with the San Francisco 49ers out of the playoffs, it was most favorable for a timely transformation. "Very smooth. The 49ers have been great, the complex has been great and everything so far is on schedule. We're kind of pushing forward. You could play on it today once we get it down, that's how strong it is." Much of the 75,000 square feet of grass had begun to go down by early afternoon Jan. 11. The remainder was likely to be in within a day or two. 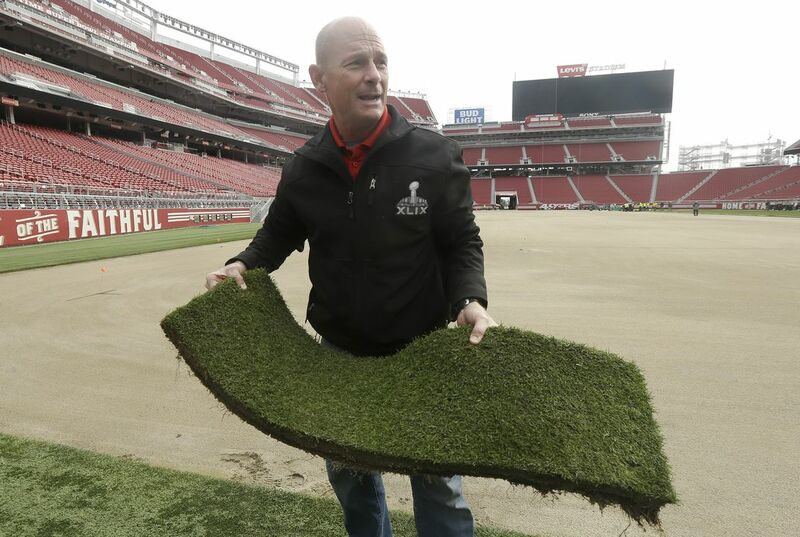 The NFL is using West Coast Turf sod for the first time since some Super Bowls dating back a decade or more, according to Mangan. That's largely based on geography. West Coast Turf operates out of California's Central Valley in Livingston. 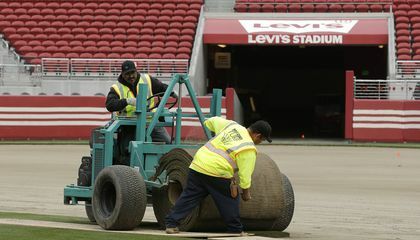 West Coast supplied the previous grass - removed early last week - that wound up staying put and durable through the course of the recently completed 49ers season. The Super Bowl grass is a hybrid Bermuda 419 over-seeded with perennial rye. It was grown on plastic sheeting, a positive change made at West Coast Turf, Mangan said. "The Niners have addressed any of their issues," said Mangan, also field director for baseball's Atlanta Braves and working his 27th Super Bowl. "We're kind of starting anew here with what we're doing. We do this on each one of the natural fields. We'll strip it completely. The field has done its job all season for them and it's done well. But for the Super Bowl, we always put in a new field." Mangan visited a month ago and has been back in the Bay Area for a little more than a week and said his staff is working 12 to 15 hours a day to be ready. Mangan is checking the weather forecast hourly given the wet El Nino cycle in Northern California after several years of drought. There are tarps to cover the field as necessary. As of Jan. 11, about 10 people were working inside the $1.3 billion, second-year Levi's Stadium, with about 30 more people joining the efforts in the next two weeks. Mangan's crew also will work on manicuring and painting the practice fields at nearby San Jose State and Stanford, but without re-sodding. The Super Bowl teams each get a chance to walk-through on the new field. "Weather we can't control. Time management is a matter of getting everybody who needs access to the field access to it," Mangan said. "Trying to do what we can when we can is a matter of trying to stay out in front of the weather. "Wednesday, Thursday, Friday now look like rain, so we're trying to speed up the process here and get ready and ahead of the weather." What turf troubles do planners worry about? One trouble that the turf planners have to worry about is bad weather, specifically rain, due to this they have to work fast to make sure the turf doesn't get ruined by the rain, another trouble is time management with poor time management they might not finish in time. I found this article interesting because I didn't know how much effort and trouble went into putting down some simple turf. The super bowl planners might have been seeking to avoid turf troubles because the turf troubles might have made a lot of things become worse because they needed a lot of turf just to replace the old turf with new turfs. The people might have been a lot of trouble to planners on arranging to place where the old turfs are because the planners might have wanted to plan where to put the turfs. The people at the stadium might have been having troubles with the turf where they are planning to put to replace the old turf where they put to use in the football stadium. Planners might have been having trouble to be working with putting where they would like to put the new turfs at because planners might have been having trouble with the turfs. Critical Thinking Question: What turf troubles do planners worry about? Answer: The Turf trouble that planners worry about is about where they would actually put the turf or how are they going to put a tarp to cover the turf from raining days. Turf troubles that planners worry about are the weather and the newly planted grass. I think that it is pretty nice for the stadium people to change the turf grass and change it into a hybrid grass that is soft and feels good. I hope that when the men play football, they don't get hurt as much as the turf because playing on turf hurts a lot. When you scrape your leg and your arms, it hurts more than a paper cut. I hope that when they play football they don't have to put on bandages and other protective gear fro the turf so that they can have a good and fun game. I hope that they can play better if they change the grass. The planners say the best thing to do is "Trying to do what we can when we can is a matter of trying to stay out in front of the weather. "(18) Another thing that the planners are worried about is "Wednesday, Thursday, Friday now look like rain, so we're trying to speed up the process here and get ready and ahead of the weather. "(19) The best thing to do is hope that the turf does not get ruined. The old turf coming up out of the ground because its been played on so much this season or someone getting there foot stuck on a little bump and spranges it or breaks it so they put new turf down for the super bowl. Planners worry about the weather conditions because they need to get the people onto the turf to fix it.